Valentine’s Day is a wonderful opportunity for kids and parents alike to show their loved ones how much they really care. I think that lovingly handmade cards and decorations say so much more than their expensive store bought counterparts. 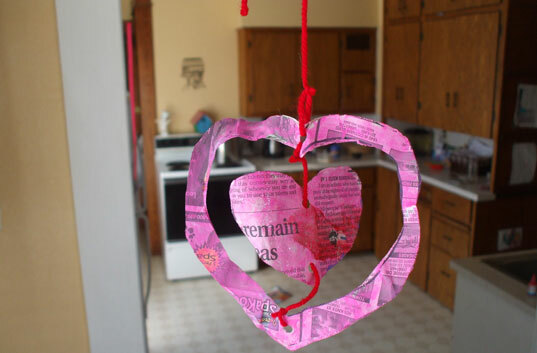 Crafting Valentines out of newspaper is a great way to celebrate the holiday with your kids, while simultaneously teaching them a lesson about creative recycling and loving the earth with their actions. 1. Start by stacking two pieces of newspaper together. Fold these pieces in half, so that you have four layers total. On the fold, draw half a heart, about 10 inches tall. Draw two more concentric hearts, with about two inches of space between each heart. Cut out all hearts. You will end up with six hearts of three different sizes. Set aside the medium-sized hearts (the one that was in the middle when you drew the lines), as they will be used for a later project. *Tip: If your hearts curl up around the edges, try placing a towel over them, then ironing with a warm iron with the steam off. 3. Next cut three lengths of string for hanging the hearts. Attach one length to the top hole of the large heart. You’ll use this length to hang your finished work. Next, take a shorter length of string and tie it to the bottom hole of the large heart, so that the string extends up into the center of the heart. Now, thread the small heart onto this string, weaving the string into the bottom hole on one side of the heart and out the other side through the top hole. Tie the other end of the string to the bottom of the top hole, opposite where the first string was tied (see photo below). Hang your Valentine’s Day heart decoration where your whole family can enjoy it! 4. Remember those other two hearts you saved? Time to use them! Use these hearts to cut out one piece of white paper that is the same size as your hearts (the outside only, not the hole inside!). 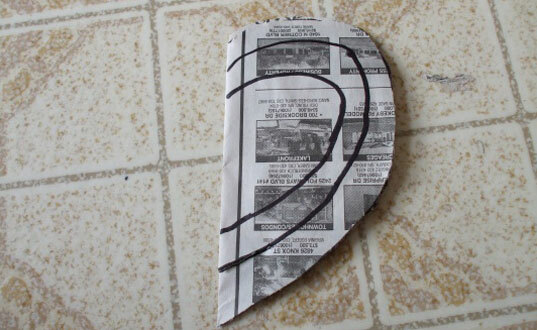 Glue all three hearts together, sandwiching the white piece between the newspaper hearts. Decorate any way you like. I mixed equal parts red paint and water again, because I love the look of the newsprint showing through the paint. After one side dries, try painting the other side another color, or writing a different message. This project would be the perfect size Valentine to stick in your little sweetie’s lunch bag! I hope these projects will help you and your loved ones celebrate Valentine’s Day more creatively, and that they helped spark your own creative ideas! So cute! I just wanted to say that be sure you put your child's name on them as well as the date. We recently went through old projects and couldn't remember whose belonged to whom! Valentine's Day is a wonderful opportunity for kids and parents alike to show their loved ones how much they really care. I think that lovingly�handmade cards and decorations say so much more than their expensive store bought counterparts. 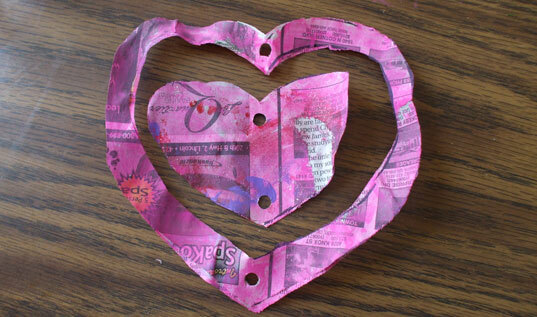 Crafting Valentines out of newspaper is a great way to celebrate the holiday with�your kids, while simultaneously teaching them a lesson about creative recycling and loving the earth with their actions.